Saturday morning is developing a new and rather pleasantly nostalgic touch. 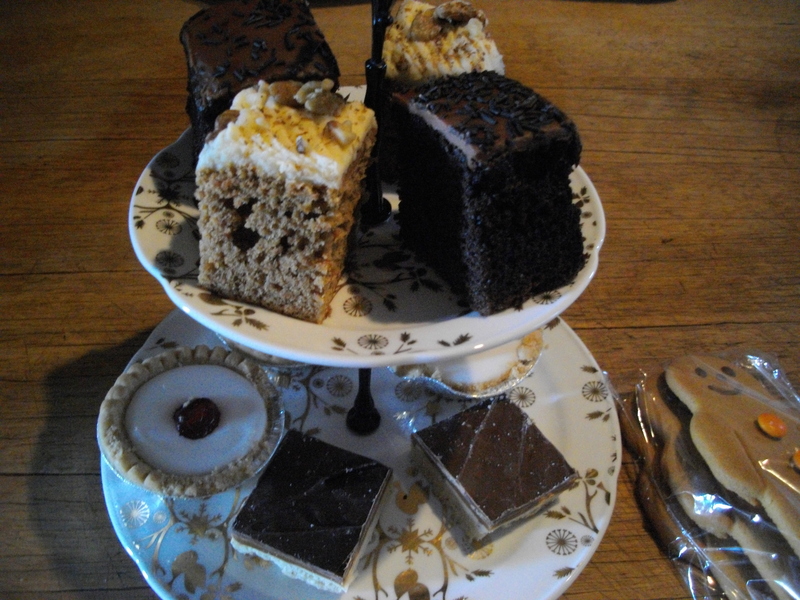 Once Jolly has been walked and the first cup of tea has been drunk, we wander round to the bakery and the sweet shop. We haven’t got the finest range of shops in the village. We’re not short of places to get take-away food, of a quality you would be wise to avoid rather than question, and we’ve got plenty of places that will cut your hair or polish your nails. At one time we had five butchers, two greengrocers and two bakers. Of these one bakery remains and we’ve become regular customers. I love baking, especially bread, but this shop is so convenient and so good. The bread and cakes taste like the bread and cakes of a south lakeland childhood. The women who work there are fabulous; funny, cheerful, down to earth and Derbyshire. Be prepared to be called “Duck” and be aware that “Aye-Up” is a first rate greeting. An iced cream bun has become the finishing touch to Saturday breakfast or a perfect mid-morning treat once the washing is on the line and the vacuum cleaner has done at least half a lap of the house. Charlie comes round and while we’re talking about the week, Frances rings up. Before long one has driven off to collect the other and we are four. Four is a long way short of five but it’s pretty darned wonderful. For lunch T prepares home made cheese scones and fruit scones to add to chocolate cake, carrot cake, cherry Bakewells and gingerbread men from the shop. It’s a two times treat. Always special to have the children round and the meal is that perfect balance of simplicity and delight. I eat too much. 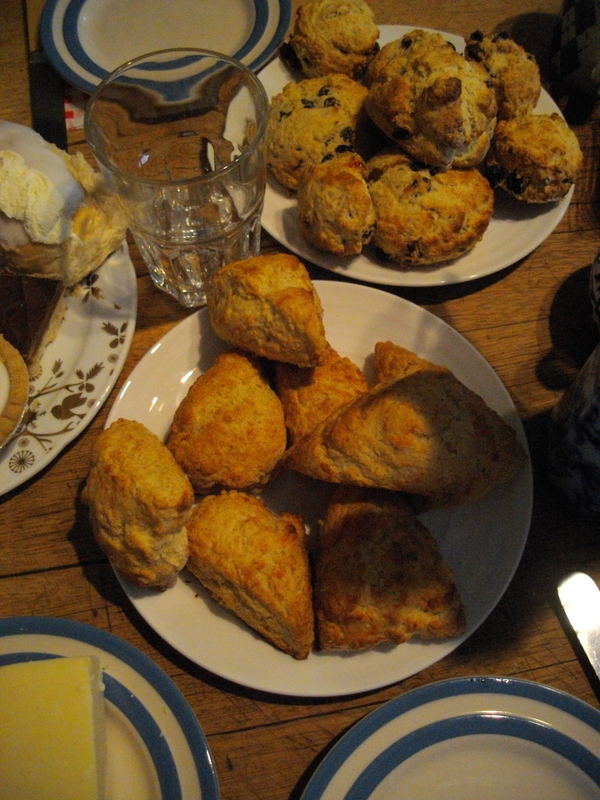 How can you leave scones uneaten when you know that, within an hour, they will have lost their magnificence? Just when the horn of plenty seems to have given out its best, a tray of biscuits comes out of the oven. T has created her own recipe and flavoured these with “The Maharajah’s Chai Hot Chocolate Flakes” from Prestat. As a drink it disappoints. As a flavouring for biscuits it is superb. I’ve always liked the idea of sweets far more than the reality. Increasingly though, I have taken to them. I’m probably entering the Werther’s Original stage of life and ought to consider taking up fly fishing or making model aeroplanes. I’ll leave them on hold for…ever… but settle for becoming something of a lover of sweets. This week it’s midget gems, bonbons and raspberry fizz balls. It’s nice to re-visit childhood. There are a lot of forgotten memories and eating sweets helps them to re-emerge. That’s the Saturday indulgence. The rest of the week is a continuation of the no meat, healthy Lenten diet we have set ourselves. There is no sense of doing without. We are eating in a different way. Never greedily but always with savour and enjoyment. 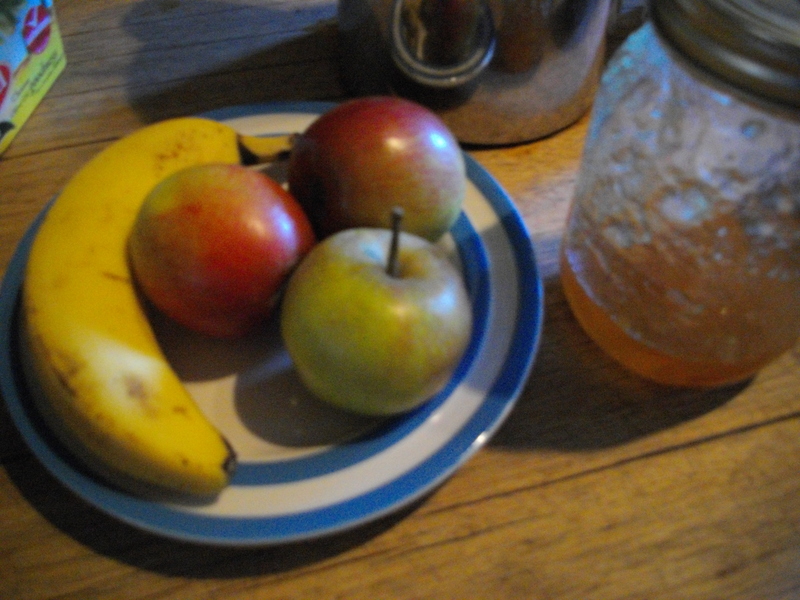 Fruit, Shredded Wheat or toast and marmalade make up almost all the breakfasts. Apples are plentiful and cheap in the shops. Conference pears are very good indeed this week. I don’t know if they have been stored or imported but they are first rate. Bananas have become an absolute necessity. It is no bind at all to swap puddings for fruit and we both feel the benefit. Asparagus is coming. The early stuff is grown under polythene and some say that it lacks the true flavour. I am not discerning enough to be able to tell. What I do know is that we have had a lot of asparagus already and will continue to enjoy it as long as it remains on the shelves. It was practically unknown when I was growing up. Along with smoked salmon it has been passed down from the high table to be enjoyed by anyone who cares for good flavours and textures. 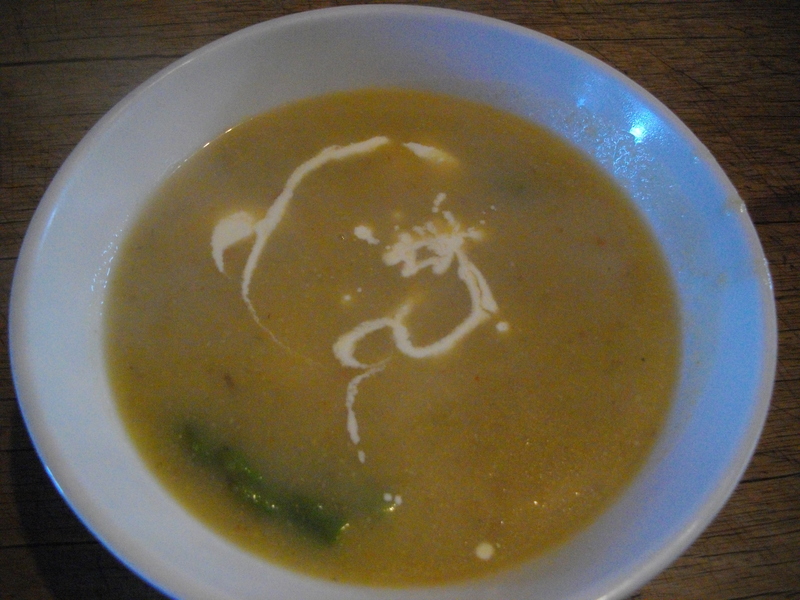 This is a simple soup but neither of us can remember enjoying a soup more. Onion, celery, unpeeled new potatoes, garlic, pepper and a bunch of asparagus are sweated down (I reserved the tips). 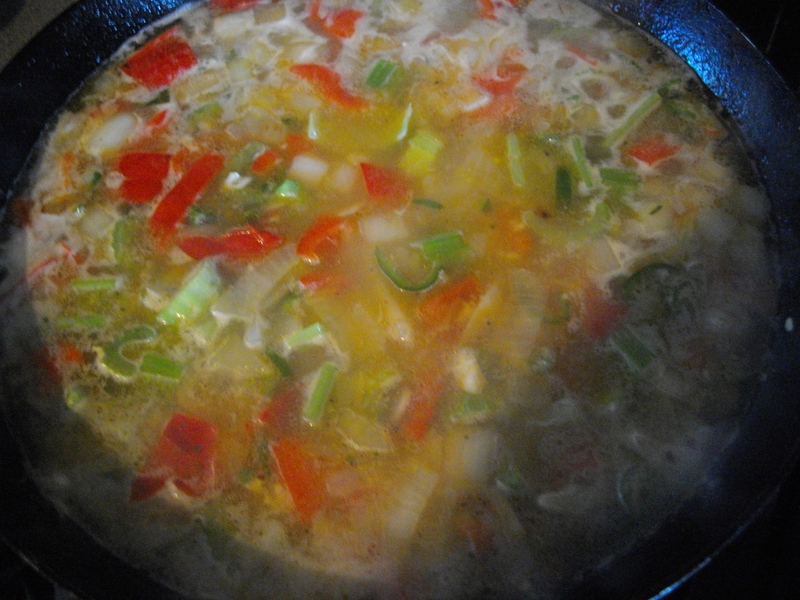 Add water and a teaspoon of good vegetable bouillon powder and simmer for twenty minutes. Blitz with a hand blender and add the tips. Simmer for a further five minutes. It’s nice to be cooking again and this tastes of spring when served with bread and a swirl of double cream. I’m getting used to the routine of not going out to work. I write for about three hours a day, read for a further two, walk Jolly (the time when I do my best thinking), and find time to enjoy both the process and product of some simple cooking at lunch time. 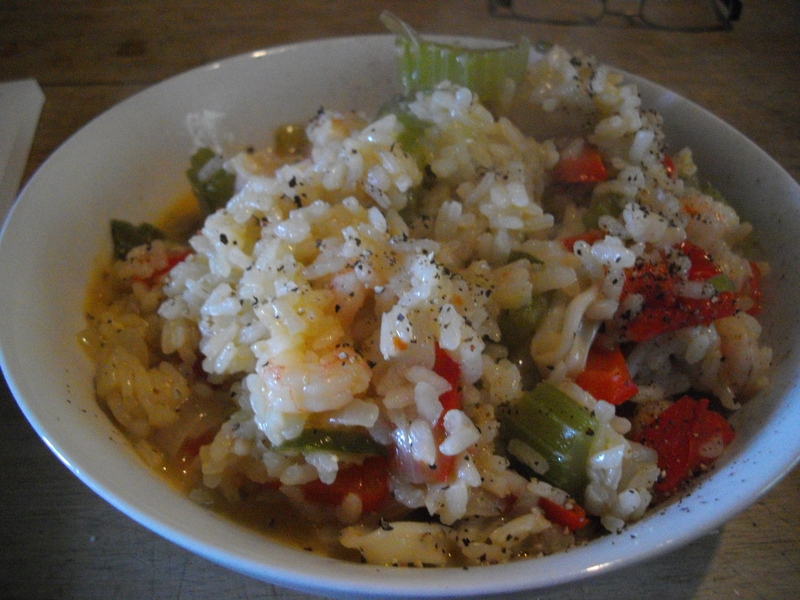 T doesn’t like seafood much, so lunch is an ideal time to make things like this seafood paella. I’m learning to cater for one (100g of rice is plenty). The prawns, squid and mussels come pre packed and frozen from the supermarket. It’s an economical way to enjoy the taste of the sea. Tuesday night is cinema night this week. 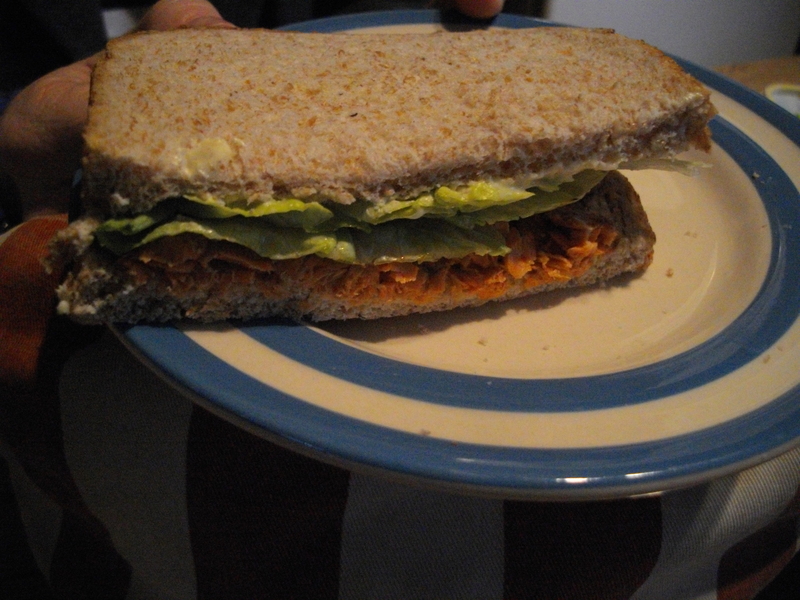 Simple red salmon (tinned) and lettuce sandwiches make a quick and easy tea before we go. We see Labor Day and wonder if we missed something. It has the makings of a good film but the elements don’t adhere. It drags and leaves us unimpressed. Wednesday we do without the main course and just have pudding. 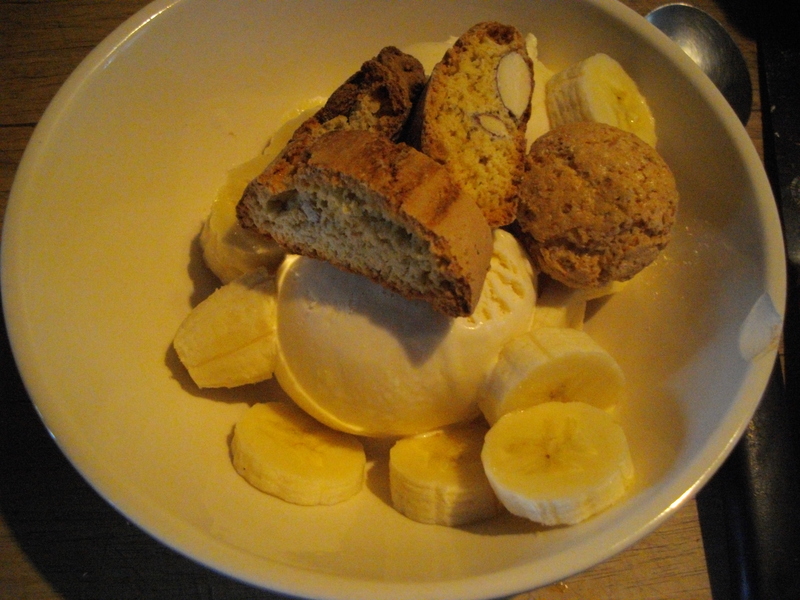 Vanilla ice cream with some Italian biscotti and a banana. If this is fasting for Lent then we are fasting in a palace of luxury. I like noodles. I like the name and the reality. I was reminded of a favourite noodle bar in Greenwich recently. Going there for my lunch used to make me feel very happy. We’d all pitch in together and sit around big wooden tables and eat huge bowls of tasty noodle dishes topped with prawn crackers and spring onion. On Thursday I recreate the experience at home and two cats and a dog help the communal spirit. These noodles are fully vegetarian. Who needs meat when you can get mushrooms? The sauce is an experiment but works superbly. 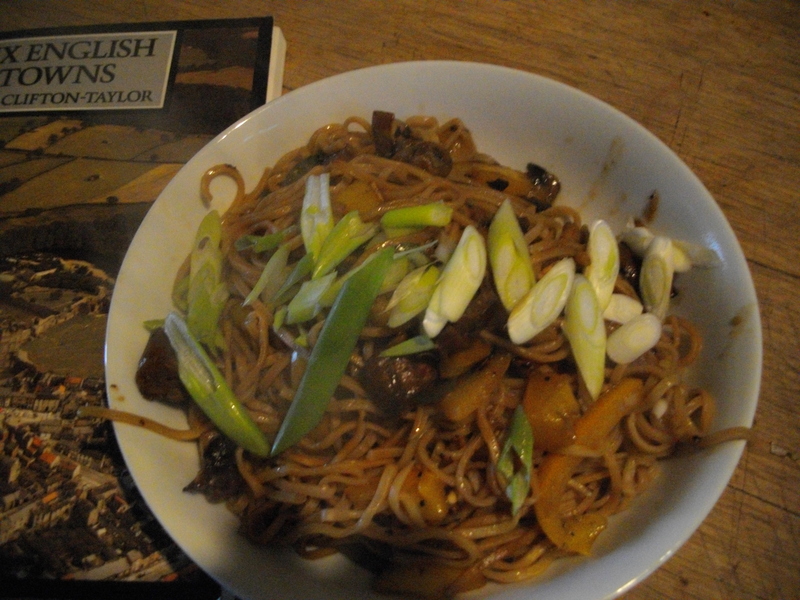 A mix of balsamic, soy and toasted sesame with a small squirt of tomato ketchup. 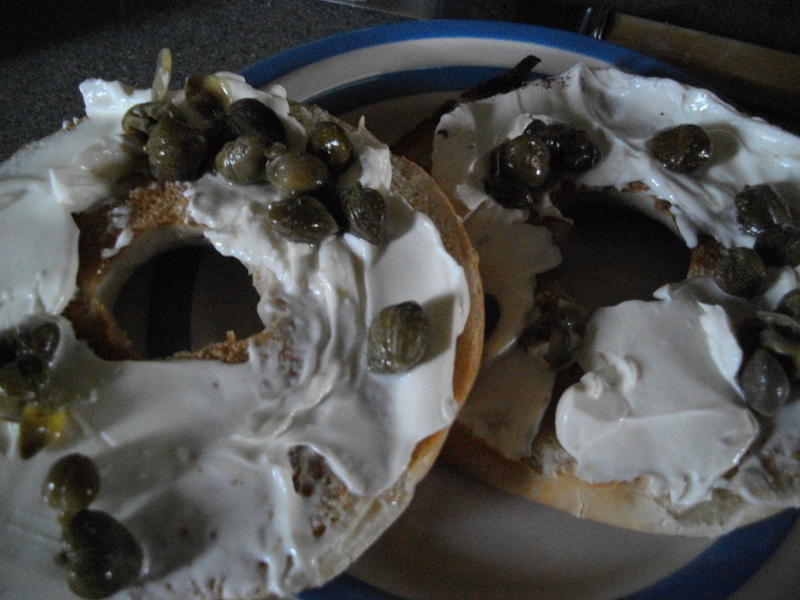 Monday had been cream cheese and bagels. The first ones had smoked salmon. 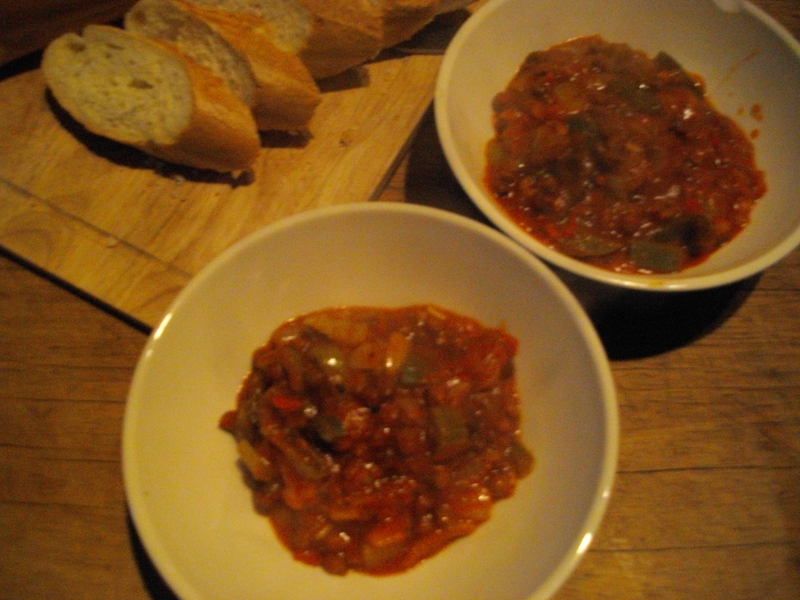 That had all gone but capers make a tasty alternative. (If you like capers). It’s quite a while since I made anything spicy. Not only does spicy food excite the tastebuds but I’m sure it has a good affect on health. Here a tin of little chickpeas forms the centrepiece for a curry that is served with some flatbreads and nothing else. No effort, no fuss, no leftovers. 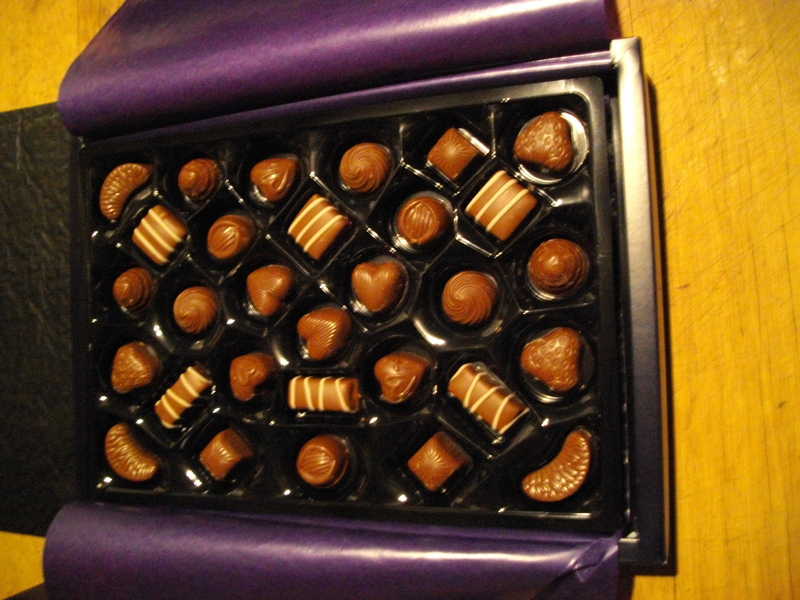 From the back of a cupboard come a box of Milk Tray. They had been bought on special offer and put on one side. They are not the greatest chocolate selection if you are after sophistication. They are exactly the chocolates I would have wanted as a twelve year old. We’ve been dipping into them since Wednesday and are not yet down to the second layer. 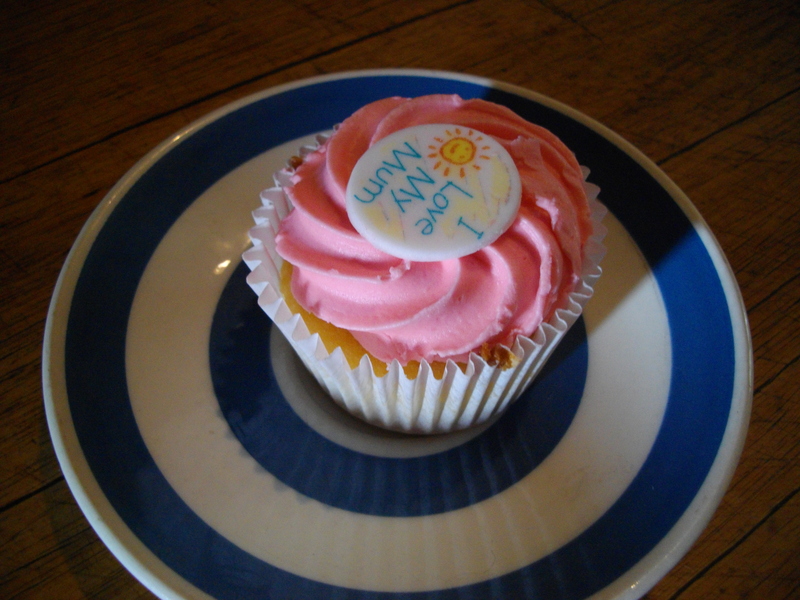 The local bakery has some special cupcakes for Mother’s Day. I’m not over-impressed with cupcakes. The ratio of icing to cake is preposterously out of balance but they do look splendid; and it’s only once a year.